BT Sport is now available on a greater selection of connected devices. BT has announced the roll-out of the BT Sport app on Apple TV, Samsung Smart TVs, and Xbox. The app is now available on these platforms to existing BT Sport customers at no extra charge, giving viewers easier access to the app on large screen devices. 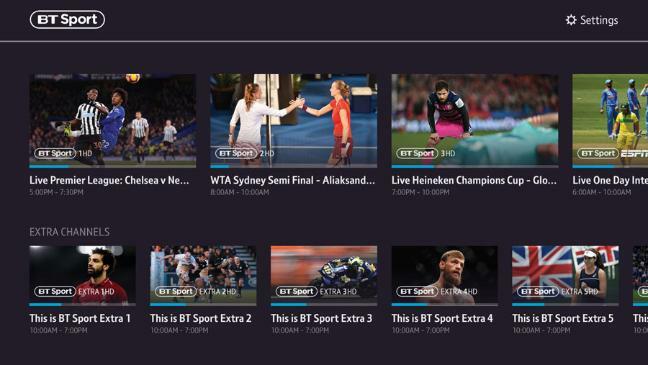 Initially allowing access to BT Sport 1, BT Sport 2, BT Sport 3, ESPN, BoxNation and the BT Sport Extra channels, later in 2019, BT Sport’s new app for big screens will also include on-demand content, highlights, TV listings, and, the BT Sport 4K UHD channel. BT Sport customers can get the new app on Apple TV, Samsung Smart TVs and Xbox by simply visiting the home page or app stores on these devices.